Dockyard Digs and Fife Pods are celebrating another successful year in providing a ‘home from home’ for contractors in Rosyth. The sister businesses have been successful accommodation providers for contractors working on the Queensferry Crossing and the Queen Elizabeth II from the port of Rosyth for many years. Looking to the future, Dockyard Digs and Fife Pods are working with Business Gateway Fife, which is providing support by signposting the business to other networks and agencies. 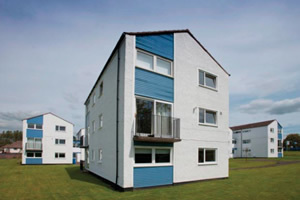 Dockyard Digs offers 42 superior HMO quality serviced apartments whilst Fife Pods is made up of 136 bespoke living pods, each individually designed providing accommodation for up to 600 people.